Your campus Macintosh machine is able to connect to campus resources using your network ID and password. To connect to a networked share drive such as your “H drive” (the home folder) or the “P drive” (the public folders) your Mac must be connected to the campus network in one of two ways. 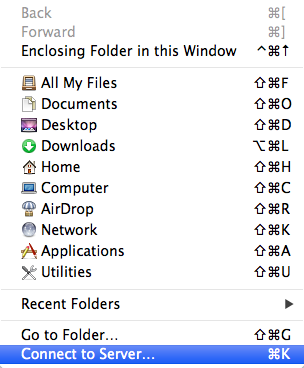 From the Finder, select Go in the Menu bar. followed by the name of the server you are connecting to.